So many foods are wonderful in a lettuce wrap. Nearly anything that can go in a sandwich will work. So when I was in the mood for a shrimp cocktail, I thought, why not? Shrimp cocktail has always been a favorite appetizer of mine. Lovely bites of meaty, large shrimp, blended with celery and homemade cocktail sauce. Yum. The first time my husband made cocktail sauce for us at home, I was impressed. Not only with how easy it is to make, but also how lovely it is to have freshly make. Now I will often mix up a batch, thaw some shrimp, and make it a last minute lunch or dinner. If you are using frozen cooked shrimp, it thaws quickly in a bowl of cold water—in only a few minutes. If you are using fresh uncooked shrimp it will take a bit longer, but how delicious when boiled or sautéed in Old Bay seasoning. Our homemade Cocktail sauce recipe is so good. Why buy it when you can quickly make your own? You can make as much as you need. It’s less expensive than buying a jar. Plus—the best part–you can adjust the bite according to what you like. I tend to go on the high side with the horseradish. Love it. 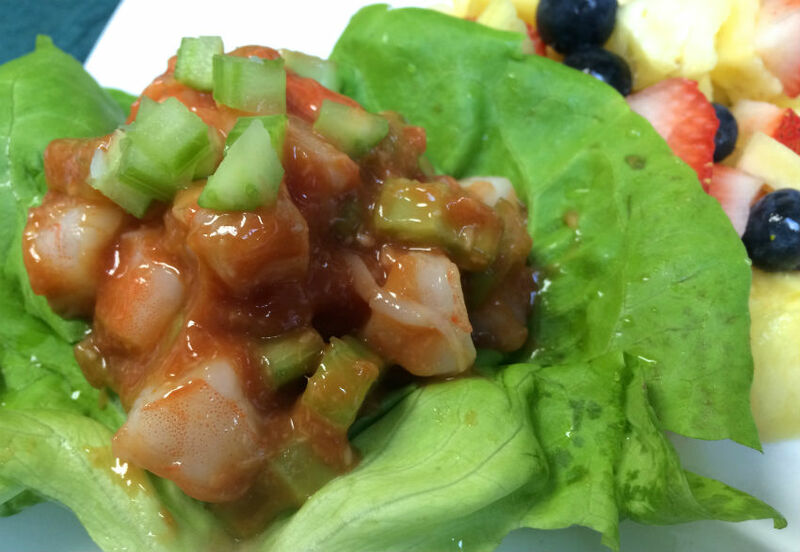 Shrimp is quite low in calories too, so it can be a light meal that is very satisfying. What a treat it is. Rolled in a leaf of butter lettuce makes for a fun finger food besides. Delicious! Clean and pat dry butter lettuce, set aside. Mix cocktail sauce ingredients, adding horseradish as you like, a little at a time. Chop celery and onion into small bite sized pieces. Cut shrimp into small bites, 3 or 4 pieces per shrimp. 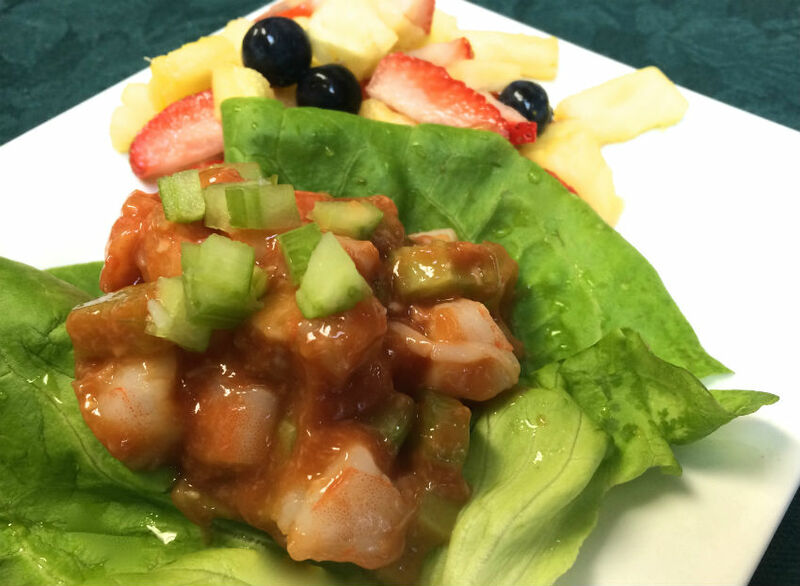 Combine shrimp, celery, and onion. Mix in cocktail sauce gradually, until you have just enough to coat. Chill until ready to serve. Serve the remaining sauce as a dip, or save for another meal. Arrange 2 lettuce leaves on each plate. Place a small scoop of the shrimp mixture on each. 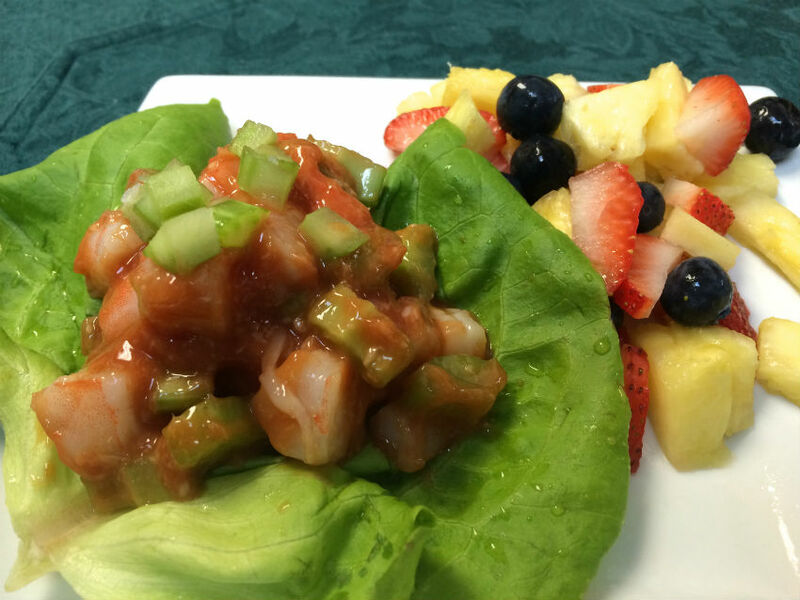 Looking for other ideas for shrimp and seafood? You can count on Williams and Sonoma for an excellent selection. ..